Welcome to the first installment of irregular DejaVu News bringing you the latest and greatest from the world of DejaVu fonts. Yes, version 1.8 was released almost on time, but without any big changes, only all accents in experimental typefaces were fixed. But at least we jumped over one percent in freshmeat.net's Popularity rank. "The Mac community will be happy and grateful if you can fix that on the whole line, especially Serif. It is the only printable and complete alternative we have to Adobe's OT Pro fonts..."
Quote from bug report by Slobodan Despot. I did not even know someone uses DejaVu fonts on Mac. 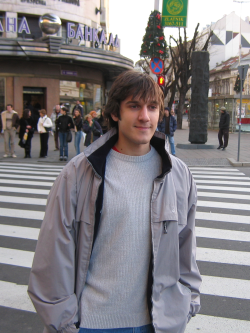 Something for the ladies: picture of the one, the only, Mr. Cyrillic himself, Danilo Šegan (from GUADEC 2005 Speakers via Davyd's Journal and Danilo's Blog). Give a warm welcome for our newest developer Ognyan Kulev who wants to work on hinting. Courageous man, I have to say.